This is the Lebanese equivalent of rice and beans. 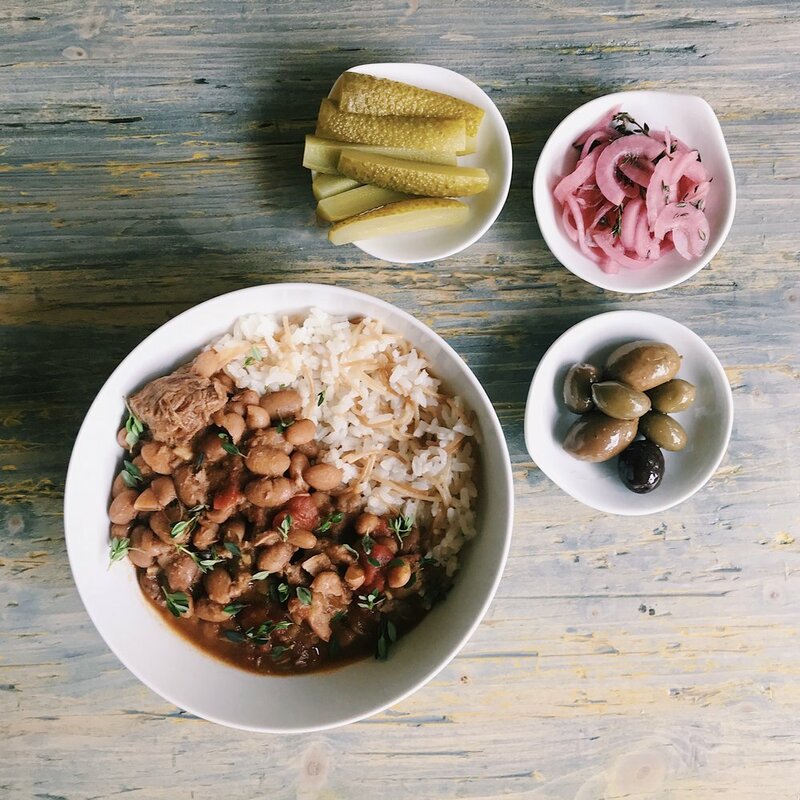 This traditional stew is prepared with melting chunks of lamb, soft beans, in a tomato broth with a homemade lamb stock that takes this dish to the next level: rich flavors and deep comfort. Don’t worry about the lamb stock, it is simply the liquid you will use to cook the seared lamb cubes… The detailed recipe is easy! Serve this dish with some vermicelli rice or your favorite type of rice. You will need one large pot with a lid, a slotted spoon, a strainer, and a bowl. Melt the ghee in a large pot over medium high heat. Sprinkle the lamb cubes with sea salt and sear them for a few minutes on all sides. Do not overcrowd the pot and work in batches if you need to. Once the meat is seared evenly, add 3 cups of water, a cinnamon stick and 2 bay leaves and whole black peppercorns. Bring to a boil then lower the heat to medium. Cover the pot and let the meat cook for 45 minutes to one hour. Check on the meat and make sure it is completely soft and almost “melting”… With a slotted spoon, remove the cooked meat and set aside on a plate. Pass the cooking liquid through a strainer, reserving the liquid in a bowl and discarding the cinnamon stick, bay leaves, and whole black peppercorns. You will use this cooking water as your stock in a few steps… patience! In the clean pot, heat two tablespoons of extra virgin olive oil, add the chopped onions and let them cook over medium heat until translucent. Add the chopped tomato and the garlic. Gently mix then add 3 cups of the stock (the cooking liquid the lamb cooked in). Dissolve the tomato paste in 1/2 cup of hot water then add it to the pot. Bring the pot content to a boil. Add the cooked beans, 1/2 teaspoon of sea salt and all spice. Bring back to a boil then lower the heat to medium-low, cover and let it simmer for at least 45 minutes. Taste and correct seasoning. Add some radishes, pickles, or homemade pickled onions for some bright notes and a crunchy bite. *Notes on lamb: In Miami, you can easily find lamb for stew pre-cut at the butcher counter or deboned leg of lamb. I usually buy a piece of the leg of lamb and cube it myself. **Notes on cooking beans: You can use canned beans if you are in a hurry but cooking beans from scratch is way better and you can master their consistency. The night before your planned cooking; rinse well the dried beans and put them in a medium bowl. Fill the bowl with fresh water 3 inches above the dried beans line and cover with plastic wrap. Let the beans rehydrate over night.The next day, using a colander, drain the beans and discard the water. Rinse well with fresh water. Place the beans in a pot with enough water to cover the beans and bring to a boil. Let the beans cook for 10 minutes. Drain the beans a discard the water. (My mom says it is a good way to minimize the familiar “bean-discomfort”… Quickly rinse the pot and return the partially cooked beans, add fresh water, a bay leaf and a clove of garlic and bring to a boil. Reduce the heat to medium and let the beans cook until they are cooked through but not mushy. Discard the bay leaf and garlic. Drain the beans and set aside… they are ready to be added to the recipe!